If Geoff Banks gains nothing else from his claim against racings ruling body, he at least won unexpected praise from the presiding judge. The bookmaker will probably have to wait until the new year, however, to find out whether he is allowed to proceed with his action for money lost due to the botched stewards inquiry involving Speculative Bid at Ascot in July. Banks is representing himself in his claim for £250, which he describes as a trifling sum but worth pursuing in order to establish that the British Horseracing Authority owes a duty of care to those who bet and take bets on horse racing. 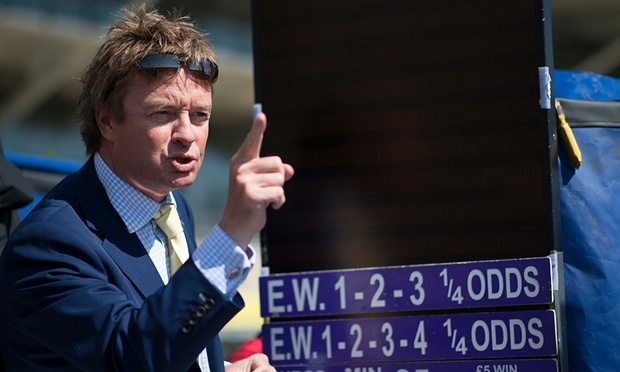 Those who know Banks from his flamboyant and opinionated turns on Channel 4 Racing may have been surprised to see him visibly suffering from nerves as he stood in court and argued that an expensive QC representing the BHA had got the law wrong and that such a duty does indeed exist. Youd make a very good advocate, Mr Banks, observed Judge Charles Harris QC at Oxford County Court when the bookmaker responded with spirit to one challenge. Youve expressed yourself very well, he added as Banks closed his arguments. Such encouragement from the bench is to be expected when those with no legal qualifications find themselves taking on a person of the standing of Kate Gallafent QC, representing the BHA, who is described in one legal publication as extraordinarily bright and a superb advocate. It became apparent here that she is also familiar with horse racing and she even admitted to a very limited experience of standing in betting shops. Gallafent is a formidable opponent and Bankss problems did not end there. While continuing to run his business since raising the claim, he has had to respond to reams of paperwork from the BHA side, so voluminous that even Harris remarked on it. Asked to locate a particular statement by the BHAs legal director, Adam Brickell, he said: Im afraid it went on very long. That would definitely be the one, Gallafent responded. Adding to Bankss difficulties, the BHA turned one aspect of its defence through 180 degrees two days before this hearing. Brickells initial written statement, sent to the court weeks ago, asserted that bookmakers are not subject to the rules of racing but on Wednesday he produced a supplementary statement reversing that view, insisting that Bankss contract with Ascot meant he was indeed subject to those rules. Included in the rules is a general disclaimer saying the BHA is not liable for any act or omission of its employees in the bona fide discharge of their duties. The BHA view is that this is a simple end to the matter, however late it has been introduced into the argument. Banks argued the disclaimer should not be treated as a get out of jail clause which might allow any company to evade any responsibility which it ought to observe. He doubted whether it was written with anything like the circumstances of this case in mind. The judge put Gallafent under pressure in relation to some of her other lines of defence, notably her argument that it would not be just to expose the BHA to a risk of being sued whenever a bookmaker or punter lost money through a mistake by one of its officials. Whats wrong with that? he asked. That would be a startling duty of care, Gallafent responded, describing the large number of people to whom it would be owed and suggesting that some bets involve sums running into six figures. Banks argued that the BHA officials showed, in their repeated announcements at Ascot in July aimed at clarifying the situation, that they had the betting public and bookmakers in mind when carrying out their functions. He produced a new detail from the day in support of this. According to Banks, a representative of the Starting Price Regulatory Commission told BHA officials they should not allow a planned Rule 4 announcement to the public, specifying that bets on Speculative Bid should be refunded and deductions made by bookmakers from winning bets. According to Banks, the SPRC man said this could not be done after the weighed in signal, which had already been given to make the result official, but the BHA officials ignored this advice and asked for the Rule 4 announcement to be made in any case. If true, that would be an act that did much to cause the confusion and bad feeling in the betting ring that day. Bankss claim is for the money he had to refund to backers of Speculative Bid, it being too late by the time of the announcement for him to make the appropriate deduction from winning bets. The confusion over whether Speculative Bid had been a runner or not arose from the fact that he emerged riderless from the starting stalls, meaning he could be declared a non-runner under a little-used BHA rule. There was no BHA response to Bankss new allegation and it appears there will be no such response until the case is concluded. It was, strictly, irrelevant to this preliminary skirmish, at which Harriss task was to decide whether the claim is strong enough to proceed to an evidential hearing. Its been a very interesting case and I shall be interested in the outcome, he said, leaving the bench. He indicated that a verdict was unlikely before Christmas and would therefore come early in January.